To provide secure cycle parking and general cycling related assistance to those visiting the town by bike. Middlesbrough Cycle Centre is one of two town centre parking facilities in the Tees Valley. Located in the Bus Station in the centre of town it is a prime location for commuters and shoppers alike. 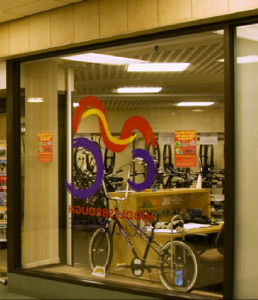 Committed to promoting cycling in Middlesbrough, it provides free secure indoor cycle parking along with showers, changing facilities and an information centre. Shopmobility Scooter and Wheel Chair hire is also available, along with a free to use Bike Library service. Members can leave their cycles safe and secure while they go about their business. The Cycle Centre also delivers learn to ride sessions and accredited road safety training (National Standards and Bikeability). The information centre provides route and touring maps, cycle guides, and other information to enable riders to access routes to work and for leisure activities throughout the Tees Valley. Guided ride instructors are available to lead rides in and around Middlesbrough. These can be used for something as simple as planning a cycle route into work, to leading a group on a tour of the local area and routes. Cycle Maintenance courses are available through our Bike Academy training facility. So why not join the ever growing band of cyclists who are members of Middlesbrough Cycle Cetnre? Membership is FREE! Simply pop into the centre with some form of identification, complete a membership form and access the facilities straight away. This entry was posted in Cycle Centre, Projects on September 6, 2018 by admin. THE ever-popular Middlesbrough Town Meal is just around the corner – and everyone’s invited to take part or tuck in. The Town Meal is an annual celebration of the growing projects that have run throughout the year, with community groups and individual families reaping the rewards of growing their own fruit and vegetables in locations across the town. This entry was posted in Food, Projects on July 20, 2018 by admin. Vegetable and fruit growing: Growing food from seed, planning and soil management. Orchard pruning and management: Fruit tree pruning, care and propagation. Horticultural machinery use: Risk assessment, maintenance and safe use of petrol powered mower, brush cutter and hedge trimmer. For over 10 years Middlesbrough has been a Fairtrade Town and has ran a full range of events and campaigns. Middlesbrough successfully renewed its Fairtrade status in March 2018.